“Between Worlds: The Art of Bill Traylor” brings together 155 drawings and paintings to provide the most encompassing and in-depth study of the artist to date. This major retrospective is drawn from public and private collections across the country and abroad and includes 17 works from the collections of the Smithsonian American Art Museum. It presents a comprehensive picture of Traylor’s stylistic development and artistic themes, explored in the context of the profoundly different worlds Traylor’s life bridged: rural and urban, black and white, old and new. 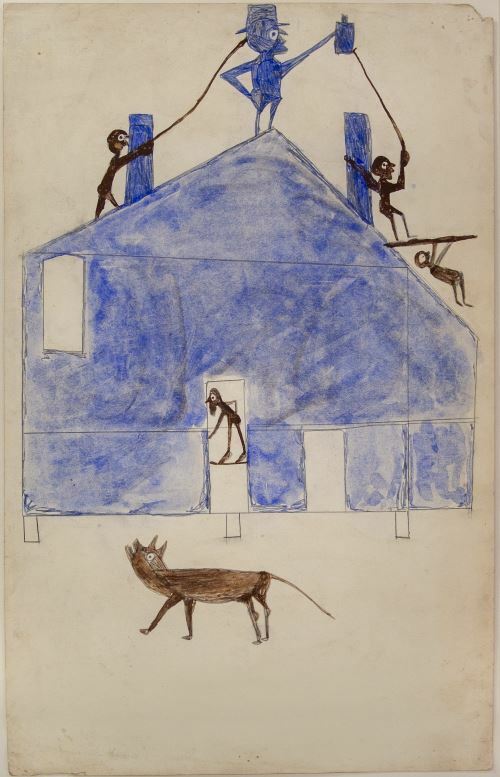 “Between Worlds: The Art of Bill Traylor” will be on view at the museum Sept. 28 through March 17, 2019. Organized by Leslie Umberger, curator of folk and self-taught art at the Smithsonian American Art Museum, the exhibition will be accompanied by a groundbreaking monograph in which Umberger thoroughly reassesses the known facts of Traylor’s life and family, his creative trajectory, and the art world’s discovery of him and positions him within the broader context of American art. The museum is the sole venue for this exhibition. A native of rural Alabama, Traylor came of age during Reconstruction and lived most of his life in the brutal era of Jim Crow segregation. In the late 1920s, Traylor left plantation life and moved to the urban landscape of Montgomery. When Traylor began drawing, he had little to his name and was living predominantly on the streets in the black business district. Montgomery in the 1930s and ’40s, though segregated, offered Traylor just enough space to become an artist of powerful vision and ability. Traylor’s drawings and paintings look back at a hard rural past and forward at a rising African American culture. Traylor’s visual depictions are unique, yet they echo the beliefs and stories that had been part of African American history from slavery through many subsequent decades. The exhibition is accompanied by a monograph written by Umberger with an introduction by acclaimed artist Kerry James Marshall, published by the Smithsonian American Art Museum in association with Princeton University Press. The 444-page publication features 205 of Traylor’s artworks along with 83 supplemental illustrations, city maps of Montgomery, family trees, a timeline of key events from Traylor’s life and an extensive bibliography. Umberger’s carefully researched chapters offer a richly woven tapestry of social history, biography and art history, creating a portrait of 19th- and early 20th-century Alabama and how it shaped Traylor and his art. The chapters explore Traylor’s life and position his art against the backdrop of his time and place, and conclude with an examination of the posthumous attention Traylor’s work has garnered. The book will be available for purchase in the museum store and online ($60, hardcover). The museum will premiere Bill Traylor: Chasing Ghosts, a film by Jeffrey Wolf, in conjunction with the opening of the exhibition, with a public screening Sunday, Sept. 30, at 3 p.m.; the film will be shown again Saturday, March 2, 2019, at 3 p.m. On Friday, Feb. 22, 2019, the museum will present the first in the Margaret Z. Robson symposium series with a host of invited scholars exploring themes related to the exhibition. Details will be available online in November. An original, improvisational jazz duet by musicians Jason Moran and Marvin Sewell, Untitled: (Blue), inspired by Traylor’s art, will take place Friday, March 1; tickets will be available for purchase Feb. 4 at 10 a.m. The Smithsonian American Art Museum celebrates the vision and creativity of Americans with artworks in all media spanning more than four centuries. Its National Historic Landmark building is located at Eighth and F streets N.W., above the Gallery Place/Chinatown Metrorail station. Museum hours are 11:30 a.m. to 7 p.m. daily (closed Dec. 25). Its Renwick Gallery, a branch museum dedicated to contemporary craft and decorative arts, is open 10 a.m. to 5:30 p.m. daily (closed Dec. 25). Admission is free. Follow the museum on Twitter, YouTube, Instagram, and Facebook. Museum information (recorded): (202) 633-7970. Smithsonian information: (202) 633-1000. Website:americanart.si.edu.